George Jennings has sent along an image from the Section NE-2B1991 Conclave. George advises that this event was hosted by Nooteeming Lodge #443. 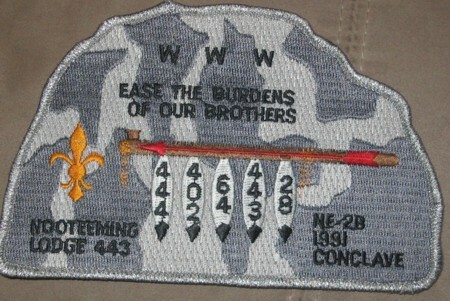 Update: August 03, 2008 Tom Wadnola supplies an image of the Jacket Patch. 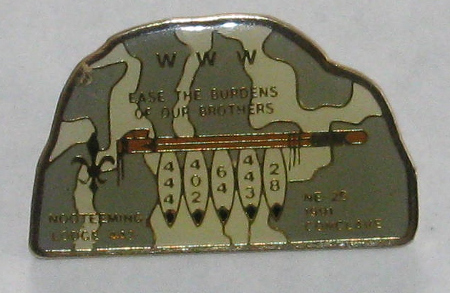 Mia Hubbert sends along an image of the hat pin issued for the 1991 Section NE-2B Conclave. If you are aware of any other items issued for this conclave or would like to supply an image of your NY Section conclave, email me at nyoatrader -at- nyoatrader dot com.